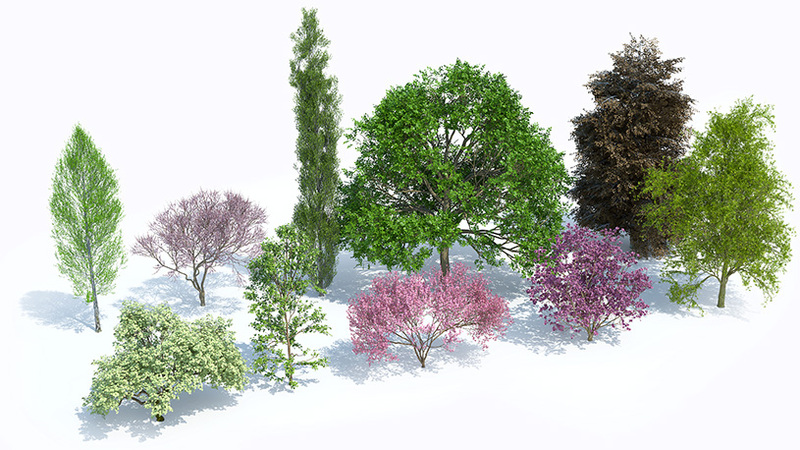 A selection of both popular and distinctive temperate deciduous tree species planted in parks, gardens, or streets including excellent specimen trees with wonderful floral display such as Norbert's magnolia, Japanese maple with beautiful autumn color, and the dark red leaved trees such as copper beech or black cherry plum. 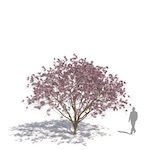 Black cherry plum in full bloom (rendering by Mario Kelterbaum using Cinema 4D and Otoy OctaneRender). 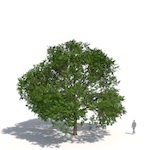 The following 10 tree species are included in the Plants Kit 6. Each species comes in 36 variations per species, i.e. 3 variants, 3 ages and 4 seasonal aspects, for a total of 360 models per Kit. Deciduous small tree or shrub with a variable, bushy habit often with low branching. 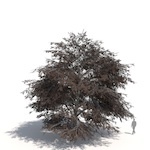 Dark brown, smooth bark becomes light gray when the tree matures. Small, deeply 5 to 7-lobed leaves often colouring well in autumn including shades of yellow, red-purple and bronze. Small red flowers in spring are followed by red or green winged samaras in pairs. Japanese maples are generally grown for their attractive foliage and shape. 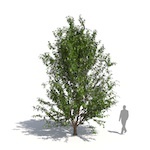 Attractive small deciduous tree or large shrub with with a low-branching, broadly-pyramidal but somewhat flat-topped habit and wide-spreading form. Warty gray alligator bark on mature trees. Oval, dark green opposite leaves with arcuate venation turn attractive shades of intensive red in fall. Large, very showy flowers consist of four showy, pink to reddish pink, petal-like bracts with yellowish-green centers. Produces red berries from early to late fall. One of the most beautiful of the native North American flowering trees with outstanding ornamental features. Medium-sized deciduous tree with a broad oval to pyramidal habit and scaly bark. Bright green, broadly ovate, alternate leaves, which might turn a beautiful yellow in autumn. Small, dark green flower-clusters each subtended by a pair of creamy-white, ovate bracts, which are said to resemble dangling handkerchiefs or doves resting on the branches. Ovoid greenish-brown fruits. Named after French missionary and naturalist Father Armand David, who was also the first westerner to describe the giant panda. This prized ornamental tree with its striking display of floral bracts in late spring was once considered to be the Holy Grail of exotic flora. It holds an Award of Garden Merit from the British Royal Horticulture Society. 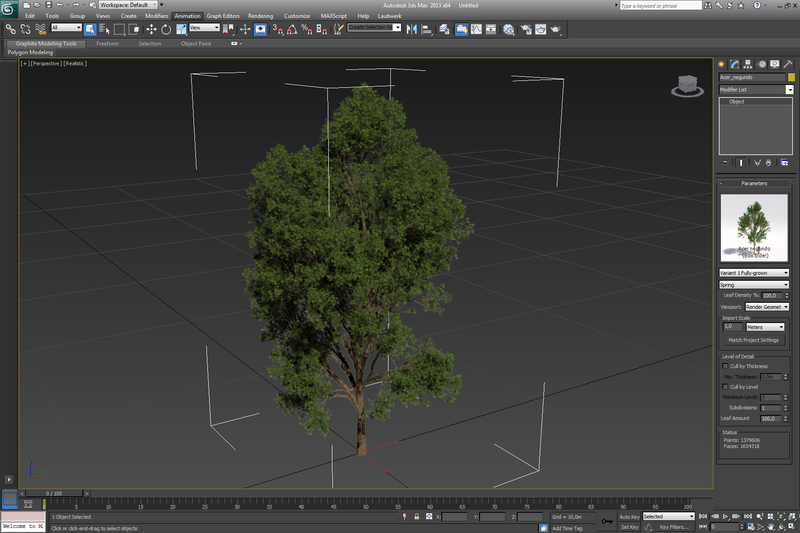 Large deciduous tree with a conical, pyramidal to rounded habit and a usually low canopy. Attractive light or dark gray, smooth bark. 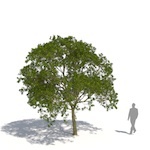 Elliptic to ovate, glossy, smooth, alternate leaves. In spring, eye-catching foliage ermerges in copper red, which will fade to deep crimson maroon purple as the summer progresses, turning deep orange to copper in autumn. Although deciduous the leaves generally stay on the tree well into winter. 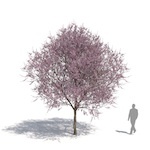 The ornamental tree makes one of the finest specimens for large scale, temperate landscapes, perfect for giving contrast to an otherwise green landscape. 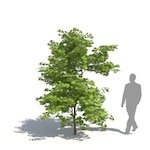 One of Europe's largest native deciduous trees with a broad, rounded, spreading habit. Smooth bark on young trees, becoming thick and vertically fissured on old trees. Large, dark green leaves are pinnately compound, divided into pairs of lance-shaped leaflets, tipped by a single one, which creates a light feathery arrangement to the foliage. Leaves are often among the last to open in spring, and the first to fall in autumn often in dull green if an early frost strikes. Occasionally with an attractive green golden to yellow autumn color. Elegant, small deciduous tree with an irregular, erect or vase-shaped form and a loosely conical to broadly asymmetrical crown. Thornless trunk with dark gray or black bark, smooth on young trees, becoming stringy and vertically fissured on old trees. Bipinnately compound leaves with small leaflets, initially light green to bright golden-yellow, gradually changing to bright green in summer, then back to golden-yellow again in autumn. Inconspicuous flowers. Fruitless. A hardy and good lawn tree with finely textured foliage, that drops leaves early, leafs out late, and produces filtered shade. 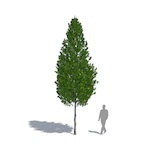 Select deciduous small, short-stem tree, initially funnel-shaped, upright, later expansive and broad, rounded habit. Smooth grey bark with coarse texture. Obovate, alternate, stout, fresh green leaves, turning pale yellow in autumn. Large and stout pink to purple from outside, white from inside, tulip-shaped flowers emerge in an abundance on bare wood in mid spring. The magnolia, a hybrid created by man, makes a wonderful floral display, filling the air with a pleasant aromatic fragrance. 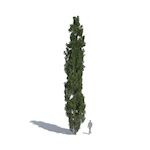 Large, vigorous, narrowly columnar deciduous tree with erect habit. The bark is grey or light green on young trees and new growth, but becomes dark grey, thickened, and ridged or furrowed on older, larger trunks. Ovate to rhomboidal bright green leaves, turning a bright golden yellow in fall before dropping. Propagation is by cuttings since this cultivar is a male clone. Small, deciduous, upright tree with a rounded to pyramidal habit. Dark brown, furrowed bark. Deep blackish-purple leaves. 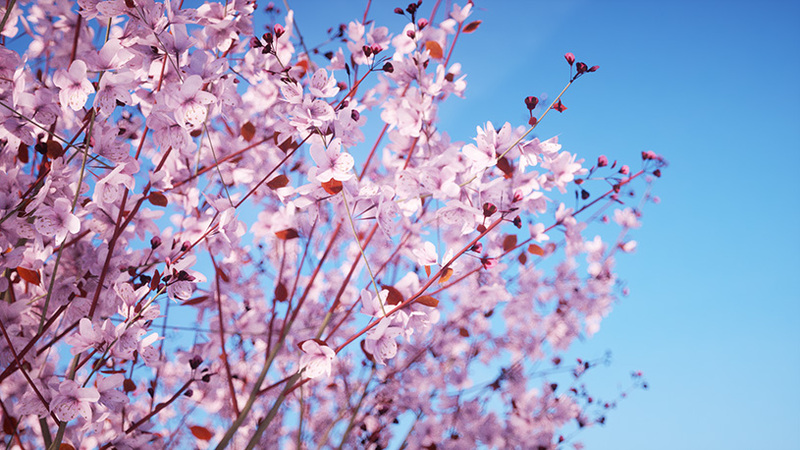 Solitary, bowl-shaped, pale pink flowers are showy, and fragrant and open from deep pink buds before the leaves. These are followed in autumn by edible, dark red and spherical fruits. This cultivar, originating from the USA, has gained the Royal Horticultural Society's Award of Garden Merit. 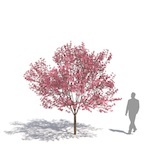 Spring & summer: 10 out of 360 temperate deciduous tree models of Laubwerk Plants Kit 6. 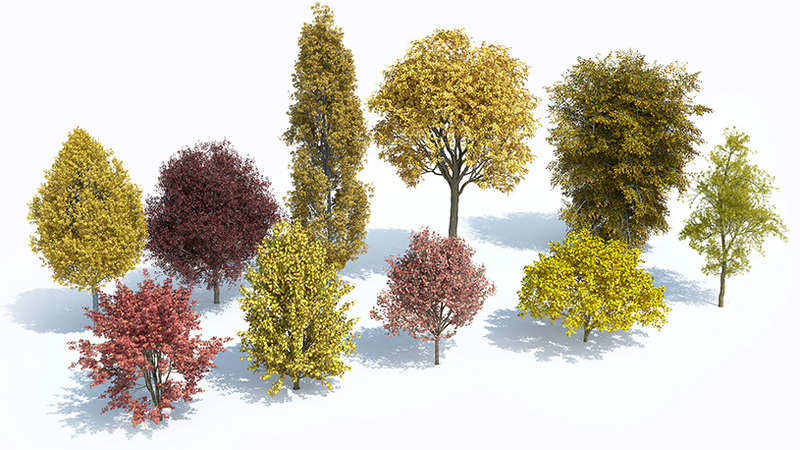 Autumn: 10 out of 360 temperate deciduous tree models of Laubwerk Plants Kit 6. 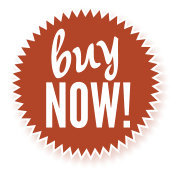 Laubwerk products are constantly being updated with the latest technology. Keep your Plants Kit up-to-date! 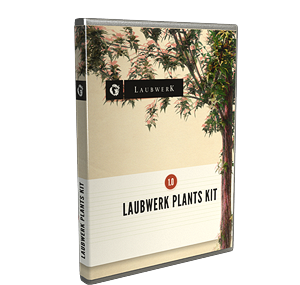 To update your Laubwerk Plants Kit 6, log in to your Account Page and download the latest update.